In the coming years, elementary-school classes from all over Indiana will take field trips to the Indianapolis Zoo to see the orangutans in the Simon Skjodt International Orangutan Center, which opened May 24. And when they head home, they’ll leave with lesson plans and activities created by Butler University College of Education students to further their knowledge and enjoyment of the experience. They might study about deforestation and how it affects the apes. Or simulate living like an orangutan. Or play a game of Orangutan Twister. Butler began to get involved with the orangutan exhibit in late 2013, when Michele Schilten, the Director of Education at Indianapolis Zoological Society, talked to Pangan about a potential collaboration. 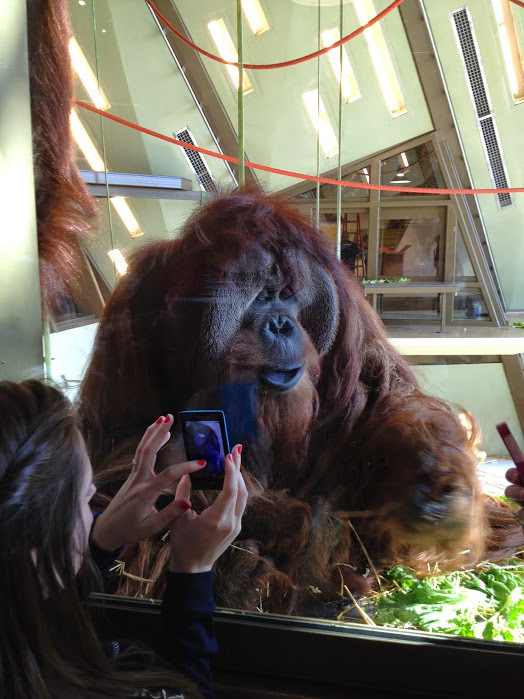 In April, Pangan’s students went to the zoo for an information session about orangutans. They researched background information about the apes and went through training with one of the zoo’s experts. The Butler students broke into groups of two or three, and designed a dozen lessons suitable for elementary school students. A typical plan includes a week’s worth of activities, as well as spelling out learning objectives and explaining how the activities fit into Indiana’s academic standards. Students will be taught related vocabulary and do readings and assignments. The zoo describes the new permanent exhibit, which is home to eight orangutans, as a place that serves as a vital education, research, and conservation center where dedicated staff and community members can work together to create a positive future for critically endangered orangutans in the wild. For Butler’s elementary education students, it’s been a chance to show their creativity in making a visit to the zoo not only fun but educational.